When a child or baby is experiencing a medical crisis, it's important to provide care and seek help as quickly as possible. But because their bodies are still forming, more delicate, and more compact than an adult's, delivering child or baby first aid is different than administering care to an adult. In order to help you provide the right type of care, we've created a step-by-step guide that you can print up and place on your refrigerator, in your car, in your child's nursery, in your bag or at your desk. - Make sure the scene is safe, then tap the child on the shoulder and shout "Are you OK?" to ensure that he or she needs help. - For infants, flick the bottom of the foot to illicit a response. - Open the airway. With the child lying on his or her back, tilt the head back slightly to lift the chin. - Ask a bystander to call 911 and retrieve an AED. If there is no bystander, call 911 after delivering 2 minutes of care. - Begin steps for CPR. - Continue administering CPR until the child or baby exhibits signs of life, such as breathing, an AED becomes available, or EMS or a trained medical responder arrives on scene. **Note: End the cycles if the scene becomes unsafe or you cannot continue performing CPR due to exhaustion. - Call 911 to report any life-threatening conditions and obtain consent to give care. Check the child from head to toe and ask questions to find out what happened. - Maintain an open airway and monitor for any changes in condition. As a result, make sure to check this baby and child first aid reference guide to make sure you’re taking the right action. Of course, the key to providing care when it's needed most is to prepare for the unexpected. 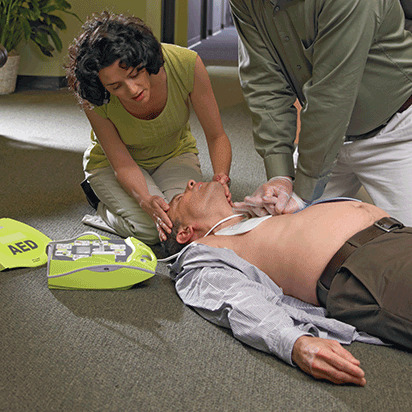 Find out how to get First Aid certified in first aid, CPR and AED use from the American Red Cross, or take a refresher course and renew your current certificate. You can also watch any of our first aid, CPR and AED videos to help you remember how to perform adult, child and baby first aid steps properly.